Walkers bag designers are not too well regarded at Chips and Crisps. Their work invariably lacks character or originality. These are no different. This new range of Deli influenced Crisps features a plain pale yellow bag with flavour colour coded side panels. The writing includes no less than five different fonts in what is a fairly bleak looking bag. There is also a small photo and graphic to exhibit the alleged contents. Having said all that, the Crisps come packaged in a brilliantly constructed bag – it is squared off with proper side panels, which mean that when opened the bag stays wide like a bowl. It can even stand up independently. That alone is worth two extra stars. As these were more thickly cut than Walkers regular Crisps, the crunch was inevitably superior. It was not hard and brittle like some Handcooked Crisps, so there were no sharp shards. Instead it munched in an even but steady deterioration from firmness to mulch, which is obviously preferable to mush. The first thing to mention about these Crisps, was they were mostly whole. It may have been the shape of the bag, but very few of these Crisps were broken. This will undoubtedly have been added to by the thickness. They were almost Handcooked style in their rigidity. The Crisps were heavily oil blistered, but again these boils were mostly intact. Best of all was the powdery orange seasoning that spattered around the Crisps. The gently curls and undulations added further to what were very attractive Crisps. There was a meaty Paprika smell when the bag was first opened. 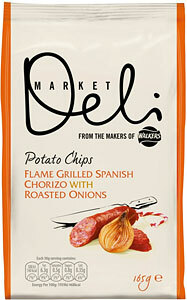 The flavour was always going to provide a test - by its very nature, Chorizo is greasy and fatty. As Crisps are also criticised by the less taste-enlightened, as greasy and fatty, it was always going to be difficult for this flavour to stand up to understandable scrutiny in this area. However, the crisp firmness of the Crisps allowed us to overlook this to hunt for the flavour. If anything, they were more tasty than your average supermarket Chorizo. There was a tinge of spiciness to a sausage flavouring. The Onion was not too evident, but overall the flavour worked well.